When will we get another chance like this? To see the second highest waterfall in the world? A waterfall second only to Angel Falls in Venezuela. 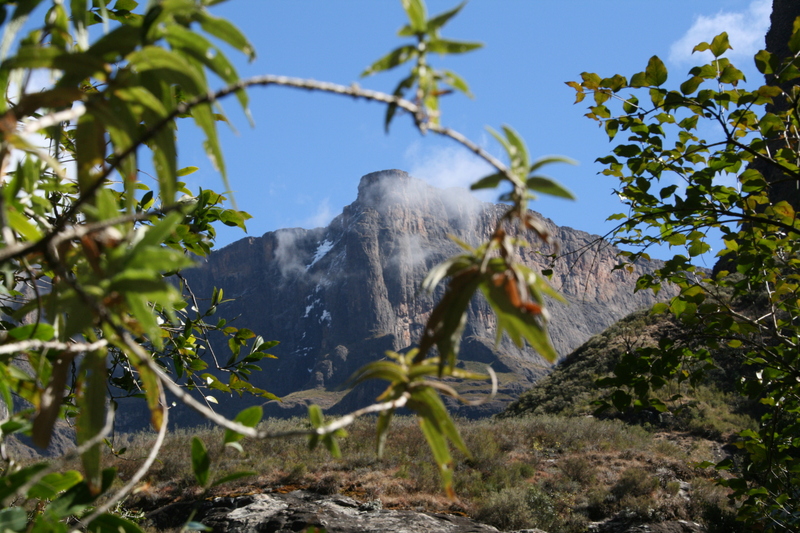 Godfried wanted to guide us on a hike to see Tugela Falls, and we said yes. According to our guide books, Tugela Falls in Royal Natal National Park has a total drop in five free leaping falls of 3,110 feet. After heavy rainfall, the books say you can see the falls from roads leading into the park, and the Gorge Hike, which we were about to begin, brings hikers to the base of the falls. 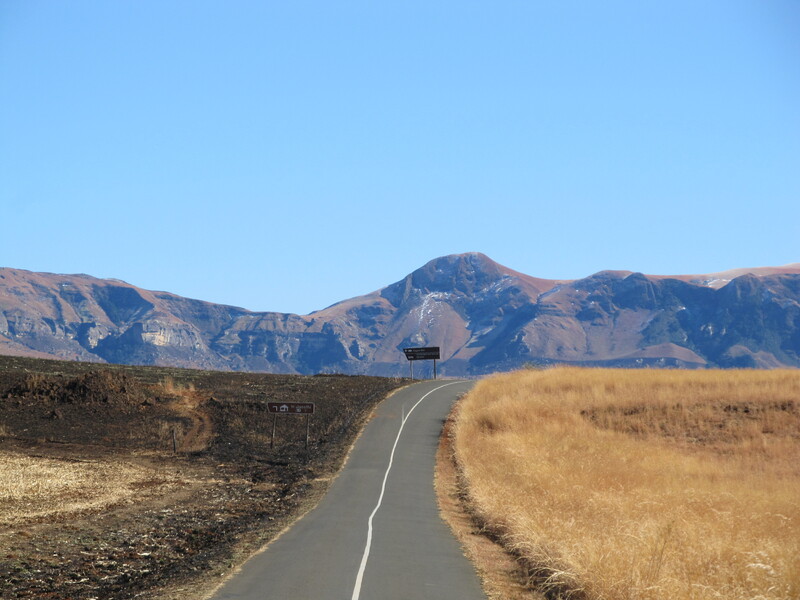 In our friends’ vehicle, we followed the car containing Godfried and a Dutch family down a dirt road and onto the highway toward Royal Natal and the waterfall. The sky was blue and clear and the sun warmed our legs, bare with our bravery against the chilly morning. Amber grasses waved as we drove toward the snow skimmed peaks; it was winter in the northern Drakensbergs of South Africa. On the way, we stopped at a rural store so Godfried could buy minutes on his cell phone, and my friend and I entered the small shack, looking for a soft drink to appease her queasy stomach. The store was small, a single room whose goods were confined in a cage. Floor to ceiling bars separated the worker from the customer. Only the coke machine and bags of dog food were available without a key. We paid for the drink and were on our way. We parked at the trail head, used the facilities, and headed off on a winding dirt trail, stopping only to check out a small snake, to look at a bird, to eat a snack. The dirt trail turned into a stone one, where boulders filled a gorge and white blazes marked the way. 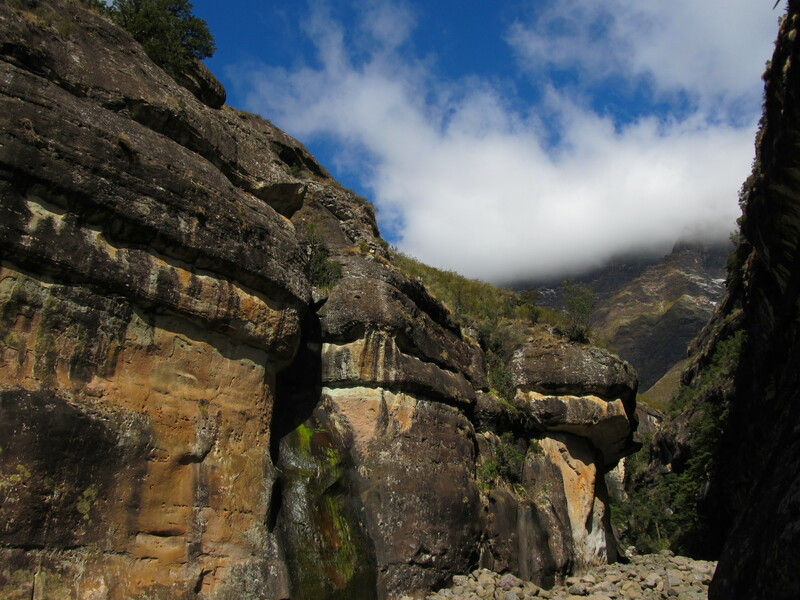 We climbed and climbed through the red and yellow and grey gorge, its walls stained by water trickling over its edge. We saw and heard people speaking Dutch and English and Spanish on the trails, a few jumping from the rocks to the deep swimming hole below. “How much further?” we asked Godfried, when we’d finished our lunch and a good 4 hours of hiking. He pointed up and over. “Just a few minutes,” he said, eventually taking us up the ladder and over the rocks to a spot not far ahead. He stopped and pointed, and when I leaned forward and peered into the bright sun with my binoculars, I thought I could see it, just barely. Across the gorge, on the flat headed peaks of the Amphitheater, where fog spilled and the sun reflected a shiny blackness, there was the waterfall. Frozen. “It is not a proper view,” Godfried said. But we wondered. How many tourists did he take on this hike? We laughed that night, after a 3-hour hike and a 30-minute ride back to our cabin. Although tired and sore, we didn’t regret the hike with its beautiful views of the gorge and the Amphitheater. The promise of the falls lured us on a hike through colors and rocks. And now we can say we’ve seen Tugela Falls, the second highest waterfall in the world. Greetings from England. What a great post. Love the detail you describe and the photos are brilliant. That first photo with the mountain range in the background looks awesome. I’ve never seen a falls in person but i’m certainly going to make it part of my adventures. I will stay tuned with your future posts. Thanks. The Drakensbergs are gorgeous. We only visited the northern area, I hope to explore the southern areas on my next trip, whenever that may be!